At left is Rep. Rebecca McWilliams, D-Concord, who is the prime sponsor of House Bill 420. Next to her is Democratic media personality Arnie Arnesen. 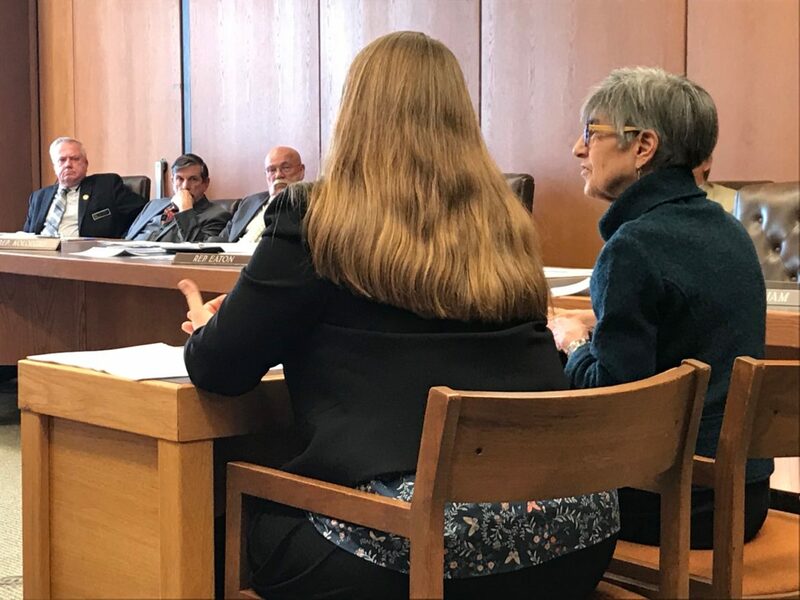 They testified before the House Public Works and Highways Committee Tuesday at the public hearing in the Legislative Office Building in Concord. CONCORD — Should a building, bridge, road or state park facility constructed with public money be named after a living person or should he or she be dead to receive the honor? While some states and the US Postal Service have rules or statutes that prohibit naming any facility after a living person, New Hampshire does not. In recent years, former Manchester Mayor and Executive Councilor Raymond Wieczorek has had the Manchester airport access road named after him as well as the plaza in front of Southern New Hampshire Arena formerly the Verizon Center, and the late Executive Councilor Raymond Burton had a highway overlook in Bretton Woods and a building at Plymouth State College named after him while he was still alive. Gov. 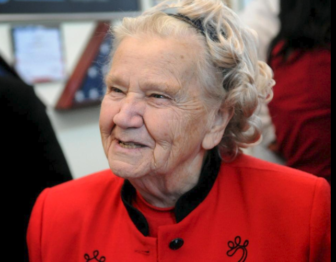 Sununu signed a bill last year to name the Little Bay Bridge connecting Newington and Dover after former Executive Councilor Ruth Griffin. And the University of New Hampshire business school and complex is named after sub-prime mortgage originator Peter T. Paul who donated $25 million to the institution that covered the entire cost of the facility. House Bill 420 would prevent naming any structure constructed with public money after anyone living. Unlike the post office where facilities can’t honor a person until he or she has been dead three years, or five years for some states, HB 420 only requires that the person is no longer living. “You never know what someone will do when they are alive,” said the bill’s prime sponsor Rep. Rebecca McWilliams, D-Concord, noting Louisiana allows the public to report a mistake in naming a facility for a living person and the official who committed the error has to pay to replace the signs. Former Democratic gubernatorial candidate and radio show host, Arnie Arnesen said the elementary school near her home is named after Christa McAuliffe, the teacher in space who died when the Challenger exploded after liftoff. McAuliffe reflects the values of the state and the institution, but Peter T. Paul does not, Arnesen said. Arnesen said she became aware of Paul and what he did after he created a political super political action committee to support the Congressional candidacy of the former Dean of the Paul school Dan Innis. The donation for the school was used to create legitimacy for a political candidate, Arnesen said, and the University System naming policy discourages that. She noted most of the naming due to donations is from rich white men. “What kind of a message does that send?” she asked. Committee member Rep. Walter Kolodziej, R-Windham, objected and said he was appalled. “Is there something wrong with me?” he asked Arnesen noting the examples she and McWilliams used were all Republicans. Others wondered whether requiring the person to be deceased would reduce donations, but several supporters said that is difficult to determine. 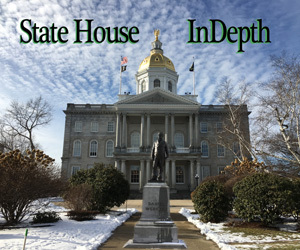 Longtime committee member Rep. John Graham, R-Bedford, said he generally supports the concept, but would not support it to apply for cities and towns. “I have a serious problem telling municipalities they can’t do this,” he said. Graham noted University of New Hampshire officials will meet with the committee later this month and the issue should be discussed. He noted similar legislation has passed the committee and the House before, but the Senate has always killed it. Committee chair Rep. John Cloutier, D-Claremont, said naming bills are the most controversial legislation the committee handles, and noted there are at least two other bills on the topic this session. He suggested a sub-committee study the issue or the committee retain the bills until next session in order to try to resolve the issue.